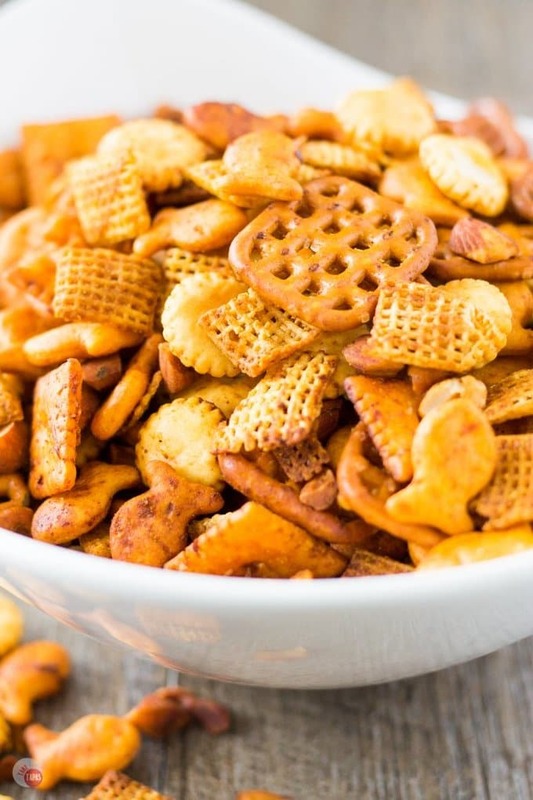 Sriracha Spicy Chex Mix For The Best Big Game Snack Ever! 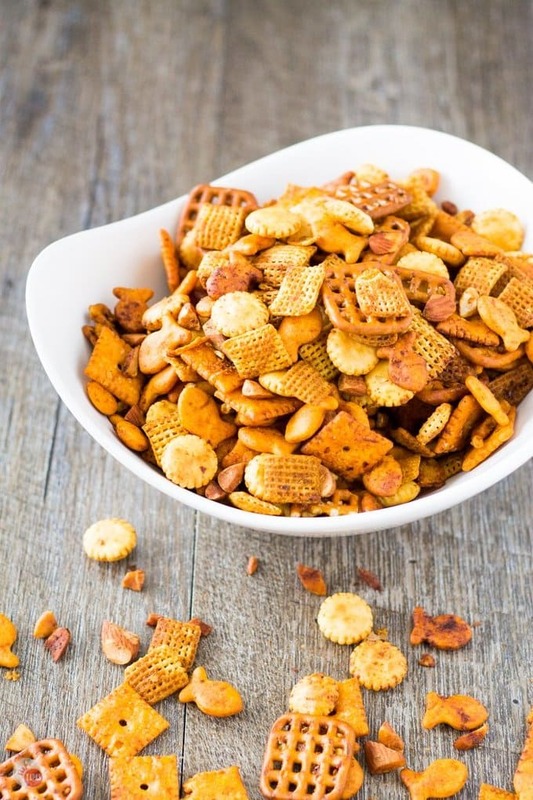 A classic snack mix is spiced up with Sriracha and red pepper flakes in my Sriracha spicy Chex mix. The combination of Chex cereal, cheesy fish and square crackers, pretzels, and oyster crackers is perfect for snacking while you are cheering on your favorite sports team in the big game! What do you do when you need a snack? You know that feeling you get when you are craving something to snack on and can’t quite find it? I can never figure out if it is something sweet, salty, crunchy, spicy, or if I am just thirsty. Yes, I hear that if you think you are craving something then you drink a glass of water and wait 10 minutes. If you are still hungry then eat something. If not, your body was just thirsty. I can tell you without a doubt that my body is always thirsty because I don’t drink enough water, but my body is always hungry too. Not super hungry, I just need a handful of something. Some bits of a snack to put in my mouth and crunch on. Maybe I just need something to keep my mouth busy. Or at the very least, shut me up for five minutes. This is where sriracha spicy Chex mix comes in! Just take me to the Sriracha Spicy Snack Mix Recipe Already! If you’d rather skip my (very helpful, I think) tips and tricks, essential cooking info, and similar recipe ideas – and get straight to this delicious easy Sriracha Spicy Snack Mix recipe – simply scroll to the bottom of the page where you can find the printable recipe card. Where does one find Sriracha Spicy Chex Mix? When searching for a snack in my house, I go straight to the snack cabinet. Loving called that by my kids because that is where all the crackers, chips, cookies, and leftover bags of leftover food that doesn’t need to be stored in the refrigerator, go. It’s also where I go find things to put in their lunch boxes. Back to my cravings because those are more important. Do your kids, or spouse, eat 99% of something and then put the container back in the cabinet or fridge? Anyone suffering from that 1 swallow of milk or orange juice? Upon stumbling to the snack cabinet and not knowing what I was craving (sweet, salty, spicy, crunchy,) and finding random bags of crackers that only contain a handful of each one in them, I decided to make my own! I grabbed the last handfuls of the crackers and snacks, whipped a quick sauce or marinade together that I modeled after the traditional baked snack mix, and made a mix to satisfy all my cravings. Maybe not the sweet one, but I can always grab a cookie after. To hit that spicy spot, I added a bunch of Sriracha and red pepper flakes. It’s El Diablo hot and will hit you where it counts. In a good way! Q: If I don’t have Sriracha can I use my favorite hot sauce instead? Q: Can I add some brown sugar to make it a sweet and spicy mix? A: You can, but you might need to watch the baking times as the brown sugar in the coating could burn. Q: How long does it last after baking? A: Depends on how fast you eat it, LOL! In all seriousness, it will last a week if stored in an air-tight container. Q: Can I substitute other crackers if I don’t have one of the ones in the recipe? A: Absolutely you can. 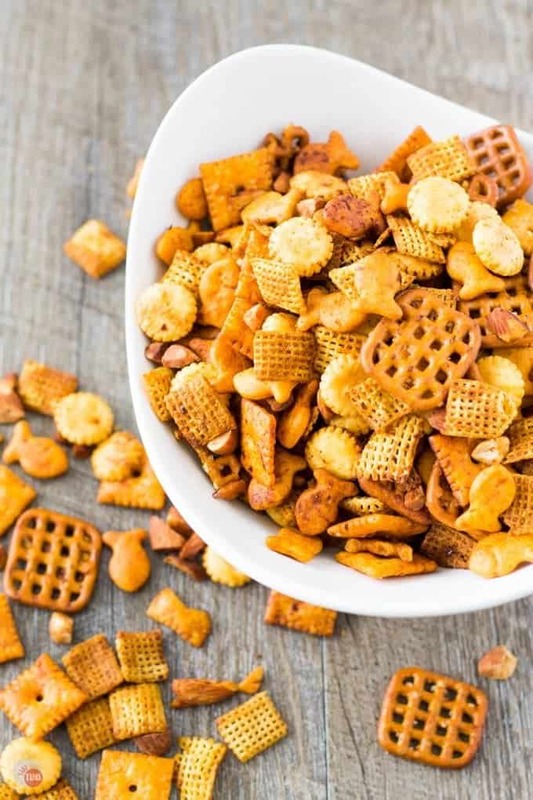 This snack mix is perfect for using up small amounts of leftover crackers and chips. Just make sure the total volume of dry crackers/cereals is the same as in the original recipe or the sauce will be too much or not enough. All the different crackers and such make for a great variety of textures and flavors. The rough-chopped almonds are firmer than the other ingredients and are a welcome crunch. And the combination of the coating sauce ingredients plays well with the cheese that is already on some of the crackers. 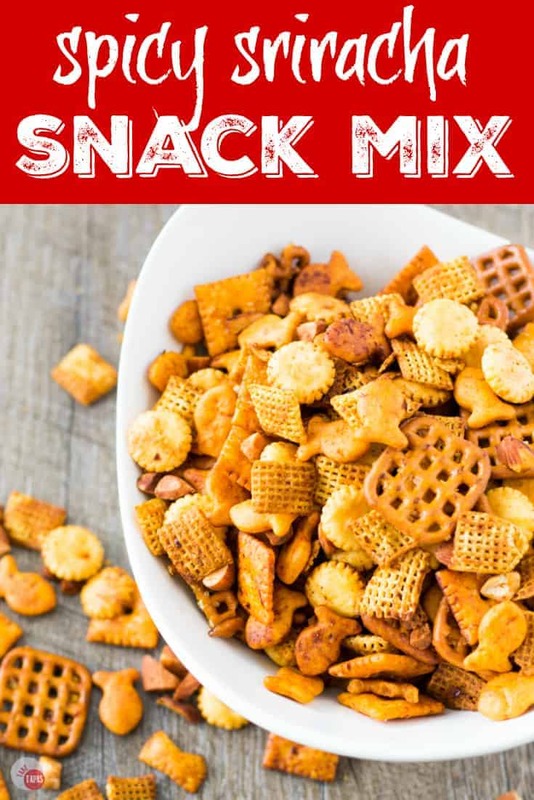 Making this sriracha spicy Chex mix snack mix takes minimal effort, I can keep an eye on it while doing other things around the house (like bingeing a show-not laundry,) and makes a ton of snack mix. 12 cups to be exact! Don’t worry if you don’t have the exact crackers in the recipe, just use what you have. Just remember that you need 12 cups of dry mix, so any combination of crackers, pretzels, nuts, etc., will work great! 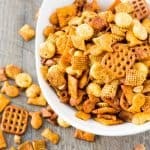 Clean out your mostly empty boxes of snacks and combine them all for a unique snack mix in my sriracha spicy Chex mix. This recipe works great for getting ready for the big game!! 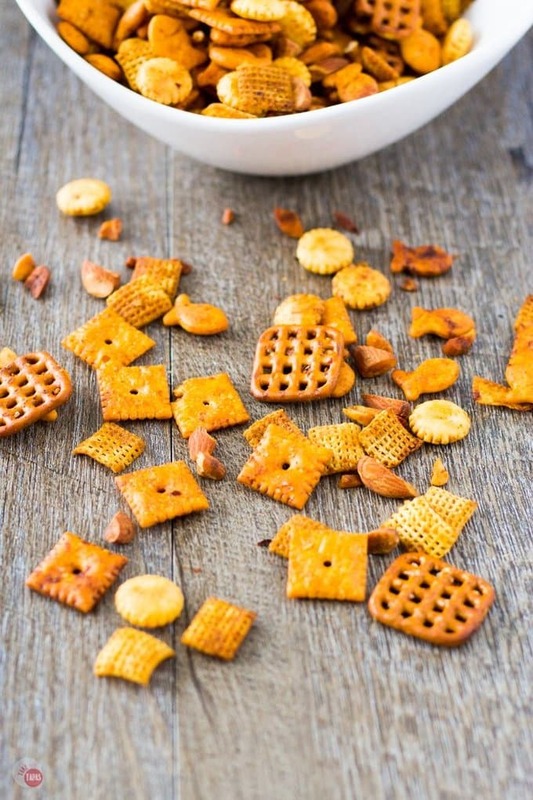 If you love this Sriracha Spicy Chex Mix Recipe as much as I do, please write a five-star review in the comment section below (or on Pinterest with the “tried it” button – you can now add pictures into reviews, too! ), and be sure to help me share on facebook! Sriracha Spicy Chex Mix For The Big Game! In a medium-sized bowl, combine all the ingredients for the sauce coating. Pour over the snack mixture of crackers. Toss to combine and make sure that the crackers are all coated. Spread on a sheet pan. Bake at 250F for 45 minutes, stirring every 15 minutes. Store in an air-tight container for up to a week or until it’s all gone! You kicked the regular Chex Mix up a notch! The whole gang will love this snack. I can not wait to try these! I am lovin’ spicy food lately! Perfect for a movie night! This would be great to munch on for movie night! Thanks for linking up with Funtastic Friday! One can never have too many snack recipes in my opinion! Thanks for sharing at Over the Moon. Thank you so much! I have to keep making it because we are eating it at an alarming rate!